If you’re reading this in between 2-4PM, your eyes may get droopy by the end of the article. How do I know? Because it happens to all of us. Unless your blood is pumping with caffeinated sugar, in the afternoon you’re going to feel sub-par. That is, unless you do what your body is asking you to do. Right now my energy is through the roof – but it’s 2:53PM in the afternoon. (And no, I haven’t had a caffeinated beverage.) What makes me different? Absolutely nothing. With one exception – I just woke up from a nap. Napping is one of the most underappreciated tools of peak performance. It’s often seen as an indulgence, a sign of weakness, something wimps do. If you’re really hard-core, the thinking goes, you just power through. Ain’t nobody got time for that! Exactly. Nobody but Albert Einstein, Winston Churchill, Thomas Edison, and John F. Kennedy who regularly napped in the afternoon; not to mention powerhouse companies like Google, Huffington Post, Ben and Jerry’s, Zappos, and Nike, who’ve all instituted nap pods and nap rooms. So why do we all have the urge to conk out in the afternoon? According to UC Berkeley neuroscientist Mathew Walker, “Humans are not sleeping the way nature intended.” In most countries around the world, sleep patterns are what he calls monophasic – meaning we sleep once—in a big block—every twenty-four hours. In his brilliant book, Why We Sleep, he shows that humans are actually meant to be biphasic sleepers. “All humans, irrespective of culture or geographical location, have a genetically hardwired dip in alertness that occurs in the midafternoon hours…This brief descent from high-degree wakefulness to low-level alertness reflects an innate drive to be asleep and napping in the afternoon, and not working.” Done. I think that qualifies as a scientific sleep pass. And the news just gets better from there. Naps have been shown to increase alertness, improve memory, increase productivity, boost your creativity, and put you in a better mood. Naps are also a powerful antidote to modern stress. Since starting The Deep Change Project at the beginning of January, I’ve been on the lookout for stress-reducing tools. A little stress in our lives is fine – but chronic stress is deadly. Not just for our bodies, but also for our brains. Chronic stress is one of the surest ways to turn off neuroplasticity – our brain’s ability to rewire itself. Want to reduce stress and get your brain working better? Take a nap. The other thing that naps do naturally is reboot our energy. Why slog through the afternoon pretending to work, but actually surfing social media? The reason we can’t focus is because our energy is low. Following an afternoon nap, it’s possible to feel that same clarity and energy that you feel at 10AM. I used to power through my afternoons with a tall glass (okay, maybe two) of sparkling Pepsi. While it did the job in the moment, the toll (and the pounds) started adding up. After years of this routine, I realized I was wrecking my body – and apparently for no reason, since naps give me a cleaner, less jittery energy boost. Naps are nature’s energy drink. Most of us nap for too long, so we wake up feeling groggy. In fact, it’s one of the things I hear most – that when people wake up, they feel even more tired. That lethargy – what scientists call “sleep inertia” – is a product of passing a critical threshold when our brain goes into deeper sleep. But if you don’t give your brain the chance to jump into that slow-wave abyss, you can get most of the benefits without the costs. How do you do it? Don’t sleep longer than twenty minutes. As Daniel Pink in his brilliant book, When, explains, “While naps between thirty and ninety minutes can produce some long-term benefits, they come with steep costs. The ideal naps—those that combine effectiveness with efficiency—are far shorter, usually between ten and twenty minutes.” (Research has shown that a five-minute nap, on the other hand, is too short to produce any benefit.) Pink also goes on to explain how on average, it takes us seven minutes to fall asleep. So if you want scientific precision, set the timer on your phone for twenty-seven minutes – that will give you the most bang for your buck. Finding a place to take your nap can be one of the trickier parts of the equation. The best standby I’ve found is the back seat of your car. But if seatbelts-in-your-ribs cramps your style, there are other options as well. One of the ones I use in my office is the inflatable lounger. It’s easy to blow up and take down; and best of all, it’s cozy. 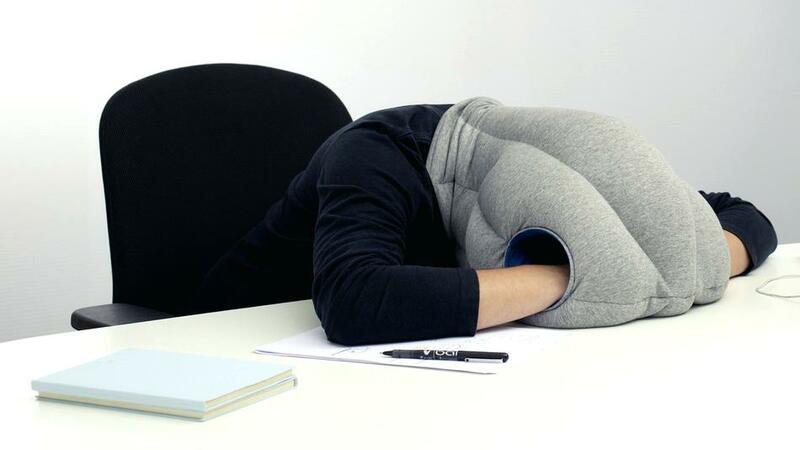 There’s also the Ostrich Pillow, which I haven’t tried, but looks amazing! Another practical option is the new “lay flat” office chair. And if you want to get really serious, there are the nap pods that Google uses. You may also want to try earplugs and eye masks, both of which make a big difference in sleep quality. Why is it so hard to give ourselves permission to do it? Besides the obvious office taboos, for me, it’s that voice in my head telling me: “It’s weird to nap in the office,” “Isn’t that what slackers do?” or “I’ve got so much to do, I don’t have time to take a nap!” (which I say in my head and then in a half-zombie-like state surf YouTube for an hour). But whenever I do it, I wake up feeling refreshed and renewed – which is why as part of my year-long journey in The Deep Change Project, I’m trying to habit-ize a daily nap into my afternoon routine. It also helps to remind myself that naps are our biological birthright – they’re knit into our DNA. And as Arianna Huffington and Sarah McKay have brilliantly argued, it’s time to reclaim them. Far from being an indulgence that mere amateurs need, if you want your body and brain to perform at their peak, naps may just become your best friend. Naps, it turns out, aren’t for wimps after all.